Traditionally chili is made with ground beef however, its nice to change things up once and a while and go vegetarian. A good chili really doesn’t need any meat especially if you’re using great tasting hearty organic veggies and aromatic spices. 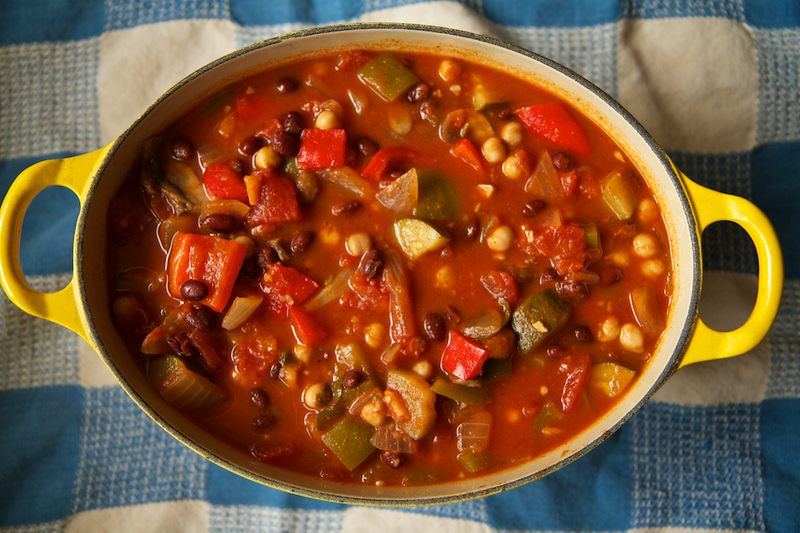 In this recipe I’ve also used legumes such as black beans and chick peas (garbanzo beans) to help give it that chunky chili texture. This recipe is easy to put together and doesn’t take too long to cook. Enjoy! Heat the coconut oil in a saucepan over medium heat. Sautee the onion, garlic and ginger. Stir in the spices. Once the onion starts to tender, drop in the bell peppers, mushrooms, celery and zucchini. Cover the pot and let the veggies heat through for 5-10 minutes. Mix in the tomatoes and legumes and bring the pot to a boil. Reduce the heat to low and let in cook for 45 minutes. While it’s cooking add the dehydrated chipotle peppers. Deseed the chipotle peppers if you don’t want your chili too spicy. Add salt & pepper to taste.